Build your team, collect your sponsors, and get involved in our greatest fundraising event of the year. 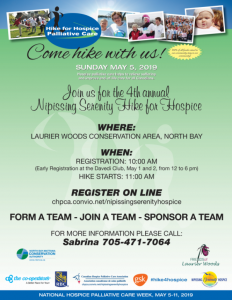 The annual hike for hospice is the Nipissing Serenity Hospice’s biggest fundraising event of the year. 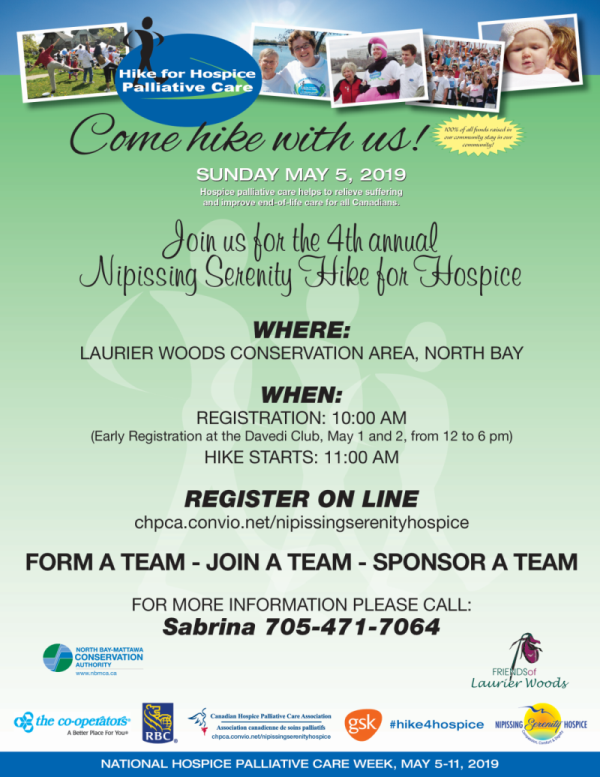 Help us make it the biggest of the biggest by registering your team and signing up your sponsors before May the 5th, then hiking on what is planned to be the loveliest day of Spring. All of the funds raised go toward building our Nipissing Serenity Hospice. The hike will take place at Laurier Woods in North Bay. You can register your team online, pick up a pledge form at the Davedi Club on Airport Road, or print one for yourself right here. You can join as a team member or an individual, or just make a donation. When a cure is no longer possible, we offer comfort and care. What is the Nipissing Serenity Hospice? It is a peaceful, caring and supportive environment that embraces all without discrimination. It is a place where quality end of life care is honored in a compassionate and holistic manner. It is a place where spiritual, psychosocial and physical needs are met to provide relief of pain and suffering. The Nipissing Serenity Hospice is a home away from home where people of all ages are invited to spend their life’s final journey. • 24 hour palliative care by an expert multi-disciplinary team that includes physicians, nurses, personal support workers, social workers, occupational therapists, physiotherapists, pharmacists, palliative carevolunteers, and multifaith chaplaincy. • Access to grief and bereavement counselling for patients, family, and friends. • A hub of expertise in skill, knowledge, proficiency and capability as set out in the Standards and Norms of Practice outlined by the Canadian Hospice Palliative Care Association.